The golden silk orb-weavers (genus Nephila) are a genus of spiders noted for the impressive webs they weave. Nephila consists of numerous individual species found around the world. They are also commonly called golden orb-weavers, giant wood spiders or banana spiders. In North America, the golden silk orb-weavers (see also Nephila clavipes) are sometimes referred to as writing spiders due to occasional zigzag patterns (stabilimenta) built into their webs, though these occur much more frequently in the webs of Argiope, such as the St Andrew's Cross spider. The name of the golden silk orb-weavers refers to the color of the spider silk, not the color of the spider itself. Yellow threads of their web shine like gold in sunlight. Xanthurenic acid, two quinones and an unknown fourth compound contribute to the yellow color. Experimental evidence suggests that the silk's color may serve a dual purpose: sunlit webs ensnare bees that are attracted to the bright yellow strands, whereas in shady spots the yellow blends in with background foliage to act as a camouflage. The spider is able to adjust pigment intensity relative to background light levels and color; the range of spectral reflectance is specifically adapted to insect vision. The webs of most Nephila spiders are complex, with a fine-meshed orb suspended in a maze of non-sticky barrier webs. As with many weavers of sticky spirals, the orb is renewed regularly if not daily, apparently because the stickiness of the orb declines with age. When weather is good (and no rain has damaged the orb web), subadult and adult Nephila often rebuild only a portion of the web. The spider will remove and consume the portion to be replaced, build new radial elements, then spin the new spirals. This partial orb renewal is distinct from other orb-weaving spiders that usually replace the entire orb web. Typically, the golden orb-weaver first weaves a non-sticky spiral with space for 2-20 more spirals in between (the density of sticky spiral strands decreases with increasing spider size). When she has completed the coarse weaving, she returns and fills in the gaps. 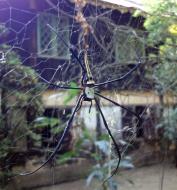 Whereas most orb-weaving spiders remove the non-sticky spiral when spinning the sticky spiral, Nephila leave it. This produces a "staff paper" effect when the orb is seen in the sun: groups of sticky spirals reflecting light with "gaps" where the non-sticky spiral does not reflect the light. The circular-orb portion of a mature N. clavipes web can be more than 1 meter across, with support strands extending perhaps many more feet away. In relation to the ground, the webs of adults may be woven anywhere from eye-level upwards high into the tree canopy. 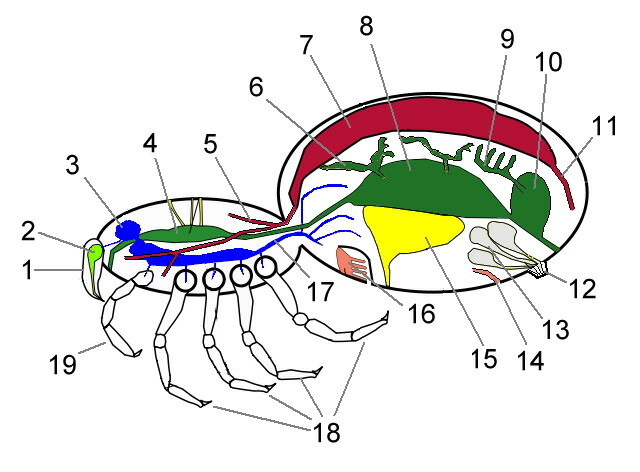 The orb web is usually truncated by a top horizontal support strand, giving it an incomplete look. Adjacent to one face of the main orb there may be a rather extensive and haphazard-looking network of guard-strands suspended a few inches distant across a free-space. This network is often decorated with a lumpy string or two of plant detritus and insect carcasses clumped with silk. This "barrier web" may function as a kind of early-warning system for incoming prey or against spider-hunting predators, or as a shield against windblown leaves; it may also be remnants of the owner's previous web. At least one reference explains the suspended debris-chain as a cue for birds to avoid blundering into and destroying the web. Stabilimenta among N. clavipes are sometimes seen in the webs of immatures nearing molt, hence the names "molting webs" or "skeleton webs" (webs with radial strands but no spiral elements). Young spiders do not generally build yellow-colored silk, and the young Nephila themselves can be easily mistaken for young Orchard Spiders (Leucauge) in general color and shape (both species sport silver stripes or patches on their abdomens, described in some references as a form of heat control). The best distinction between Leucauge and Nephila juveniles is web structure: Leucauge tends to build a horizontal orb that is a perfect circle, whereas Nephila build vertical, elliptical orbs that are incomplete (missing the portion of the orb over the hub, the center where the spider sits). Nephila seem to prefer more open habitat such as second-growth scrub or forest edges. Fences or building overhangs often do just as nicely. In addition, young spiders demonstrate vibrational motion when approached by a predator. They will oscillate at approximately 40 Hz when the web is plucked — thought to be a response to a potential predator. If a predator persists in an attack, the spider will either run to a web-support strand and thus to nearby vegetation, bail out of the web on a silk line that remains connected to the web, or jump from the web after inducing oscillations in the web that aid the jump. The Australian golden silk orb-weaver (Nephila edulis) has been observed on windy, rainy days dismantling the lower part of its web to allow strong wind to flow through a large opening in the web without breaking it. Golden Orb Weavers have been seen and photographed eating small birds captured in their webs in Queensland, Australia. N. clavipes (and many other Nephila species) are frequently victimized by Argyrodes, a genus of very small black-and-silver spiders that are kleptoparasitic. As many as a few dozen may infest a single Nephila web to feed from the host spider's captured prey. The frequent rebuilding or abandoning of webs by Nephila may be a tactic for controlling Argyrodes. Golden silk orb-weavers are widespread in warmer regions throughout the world, with species in Australia, Asia, Africa (including Madagascar), and the Americas. One species, N. clavipes, occurs in the United States of America, where it ranges throughout the coastal southeast and inland, from North Carolina to Texas. The venom of the golden silk orb-weaver is potent, but not lethal to humans. Its venom is a neurotoxin similar to that of the black widow spider; however, its venom is not nearly as powerful. Its bite causes local pain, redness, and blisters, but these symptoms usually disappear within a day (though the bite mark may leave a scar). 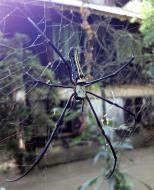 There were efforts to produce garments from Nephila silk. The spiders were fastened and the extruding thread coiled up until the spider was exhausted. However, this method did not prove commercially viable. Fishermen on coasts of the indopacific ocean remove Nephila webs and form them into a ball, which is thrown into the water. There it unfolds and is used to catch bait fish. Nine golden orb-weavers from Australia perished in the Space Shuttle Columbia disaster. The "AstroSpider" experiment is part of an international program (STARS) that encourages students to design experiments for flight on the US Space Shuttle or International Space Station. The genus name Nephila is derived from Ancient Greek, meaning "fond of spinning", from the words (nen) = to spin (related to nema νήμα "thread") + φίλος (philos) = "love".